In this article we will show you how you add phones to your Sentle system. You can use the following type of phone devices grouped as ‘External’ devices and ‘SIP – deskphone’ devices. Mobile Phones: If you use a mobile to manage your business you can use this device to route calls through to and from your contacts in the same way as you would with a desk phone. DDI: A direct dial number that will route your calls to the relevant handset that you are using. Deskphones: A ‘SIP- VOIP’ compatible desk phone is required if you wish to use this type of phone with Sentle so that outgoing and incoming calls are routed through this phone. Softphones: The term softphone refers to a phone that is located within your browser and effectively allows you to make calls directly from your computer normally via the use of a headset for best results. Choose which version you require (windows or mac) and select the download option. Please contact us at support@sentle.co.uk to discuss configuring a softphone or desk phone account. Select the ‘Configure Devices’ option to load the following window. This window will display all the current phones you have connected to your Sentle account. Select ‘add new device’ to link a new phone. The options will change slightly based on your selection. When choosing ‘External Device’ you will be given the option odd the relevant phone number be that a mobile number or DDI (direct dial number) This means that these devices can be then used to make and receive calls through Sentle. 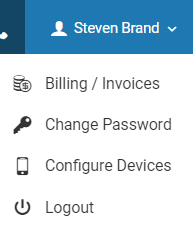 Choosing ‘SIP – Deskphone’ from the first menu will see the second field change to be called ‘SIP Address’ In here you are able to add the unique address that is associated to your SIP/VOIP device. As mentioned earlier in this article, please contact us on support@sentle.co.uk if you require a SIP device to be added. 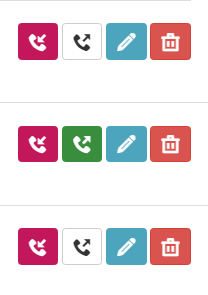 You'll notice that next to each device in the list are a set of coloured options. The Red Box indicates that the device is configured to receive inbound calls. 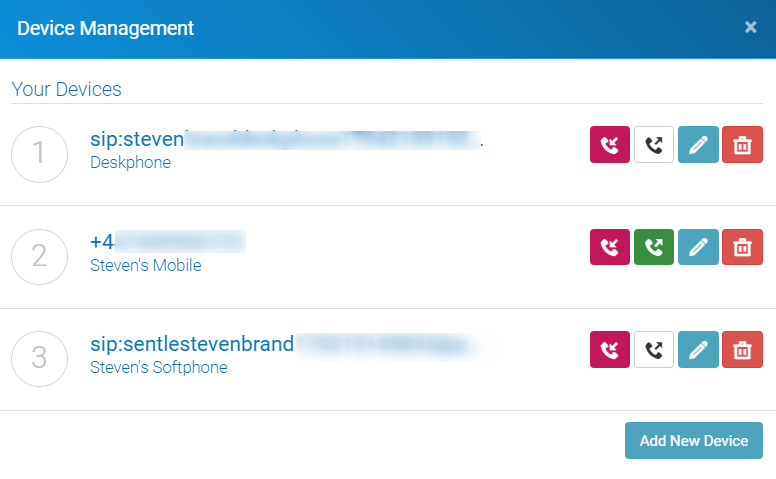 As you’ll see from the list above, you can have multiple devices configured to receive calls so all of these devices will ring when an inbound call is received. In this scenario if you head out of the office and have you mobile configured then you’ll know that any calls will make it through to you. The Green Icon indicates that the device has been configured to be the phone that Sentle will first connect to when you are making an outbound call. You can only ever have one device configured at a time to be your outbound device. This can be easily changed by simply clicking on the outbound box next to one of your other devices that will result in outbound control being swapped over. Selecting the pencil icon allows you to change the name of the device. The trashcan allows you to remove the device from Sentle. See the ‘Making and Receiving Phone Calls’ article for details on using these devices with Sentle Talk.